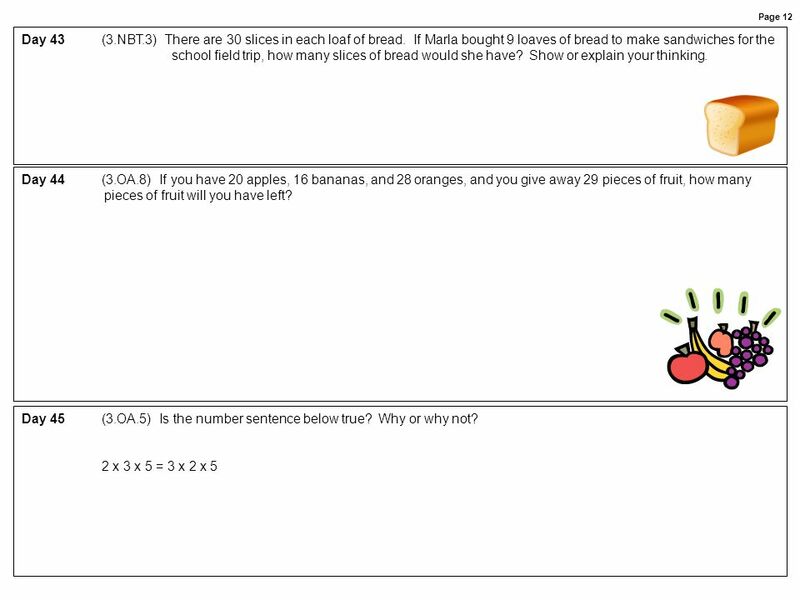 As you answer each problem, make sure you show your work. 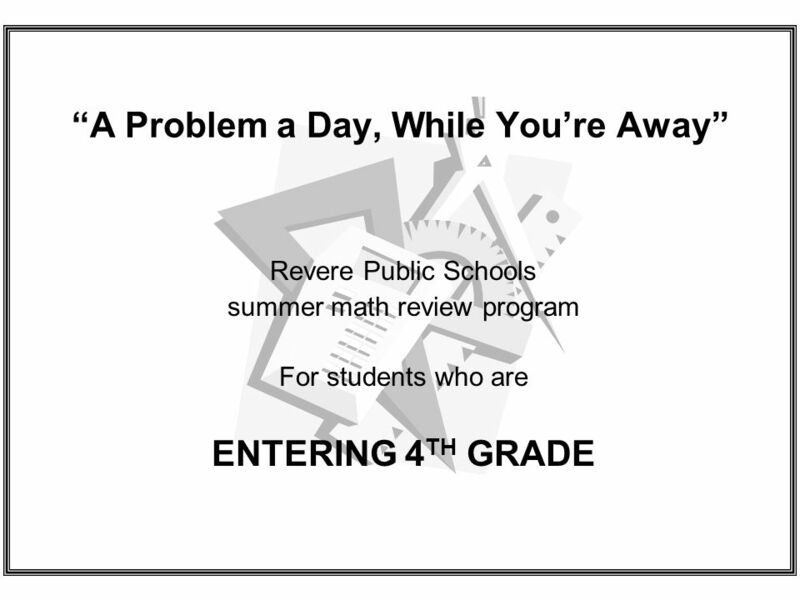 When you return to school, you will receive credit for completion, and some of the problems will be used on your first math test. 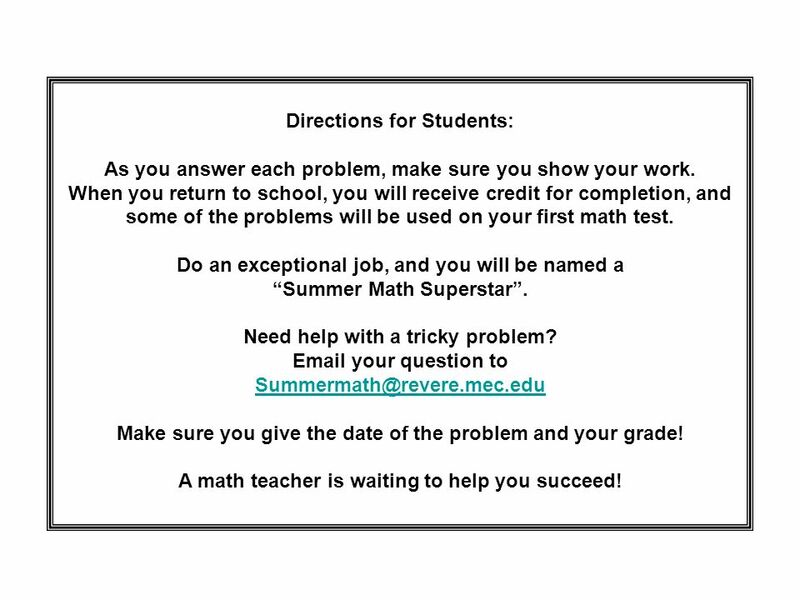 Do an exceptional job, and you will be named a “Summer Math Superstar”. 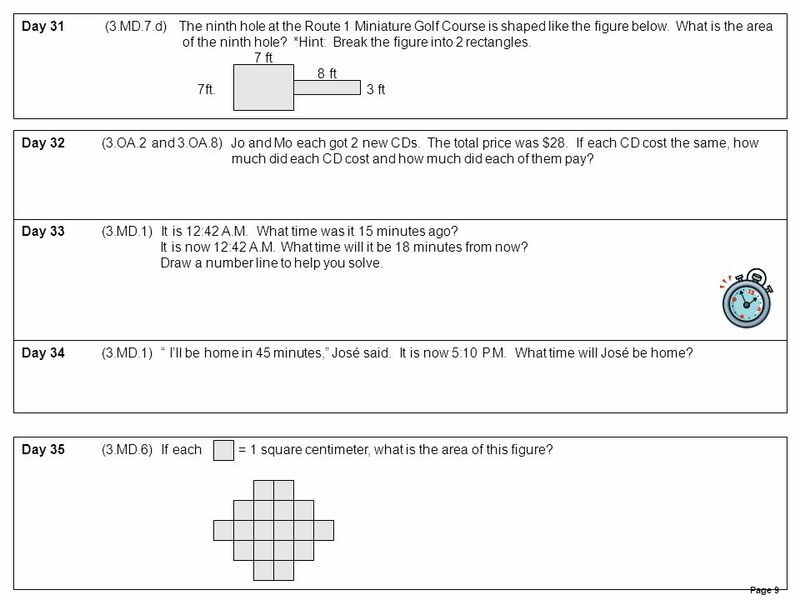 Need help with a tricky problem? your question to Make sure you give the date of the problem and your grade! 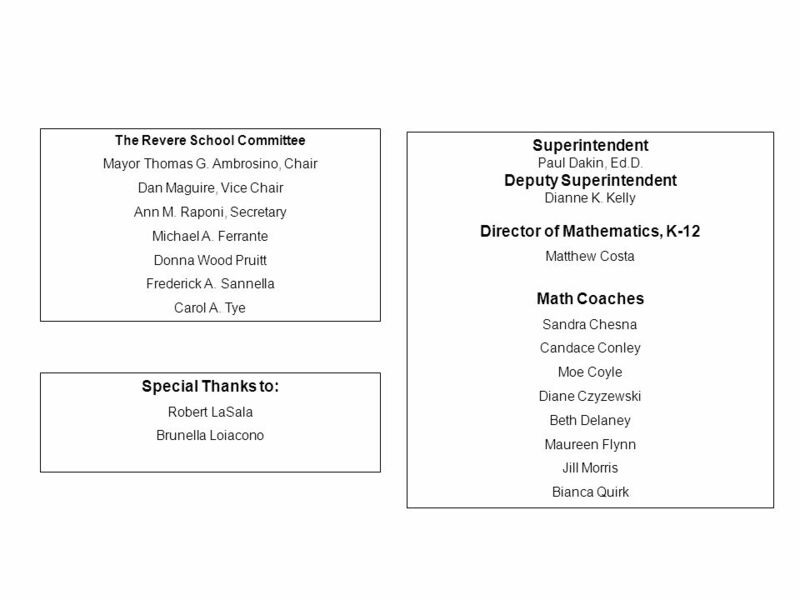 A math teacher is waiting to help you succeed! 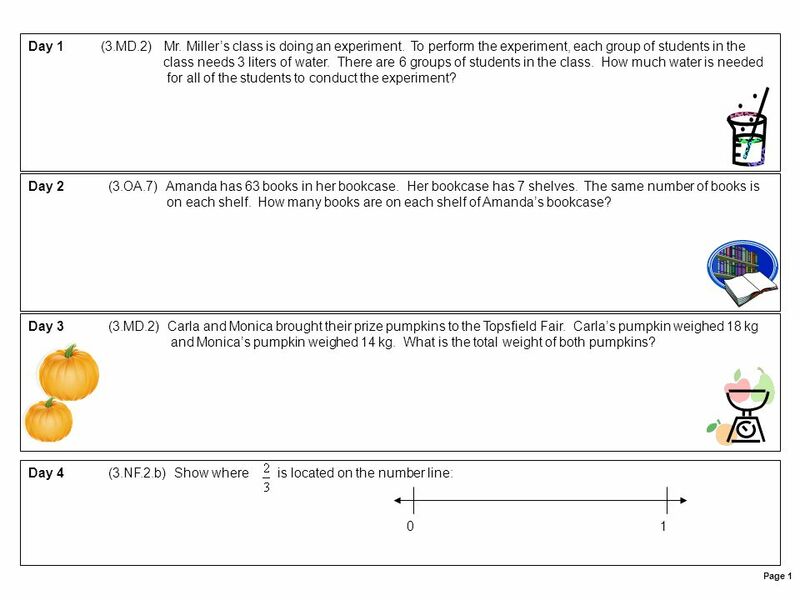 3 for all of the students to conduct the experiment? 4 6, 12, 18, 24, 30, 36, _____, _____, _____, _____. 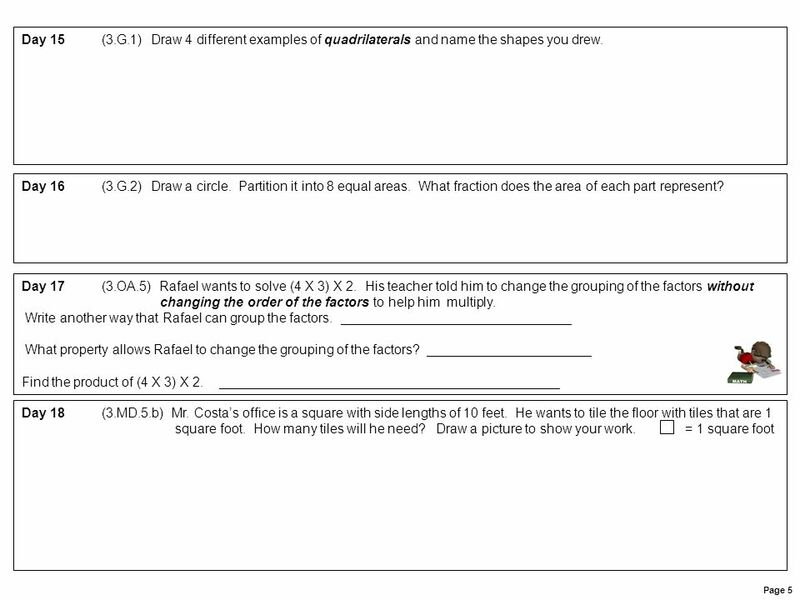 7 changing the order of the factors to help him multiply. 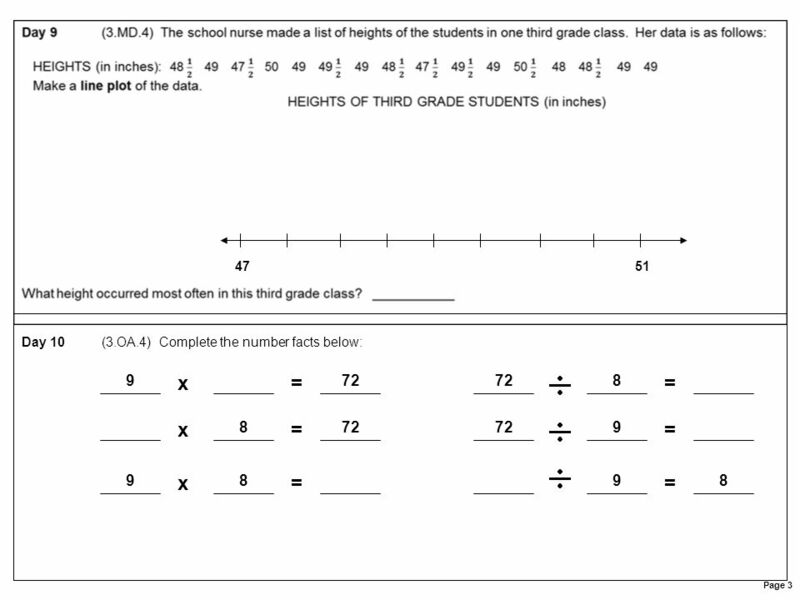 8 Page 6 Day 19	(3.NF.3.a) What fraction on the second number line is equivalent to ½ on the first number line? 1 1 Day 20	(3.MD.1) Jessica studied her spelling words for 24 minutes. 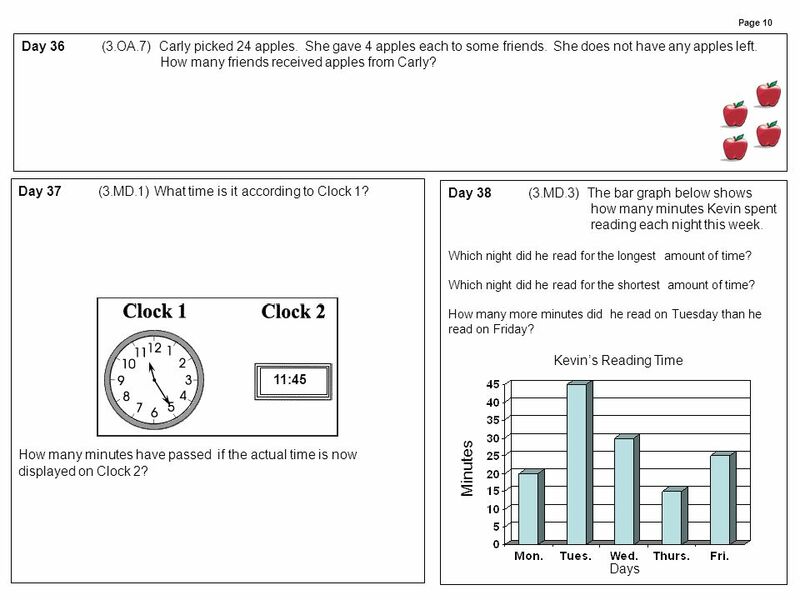 She then studied her multiplication facts for 28 minutes. How many minutes did she study altogether? 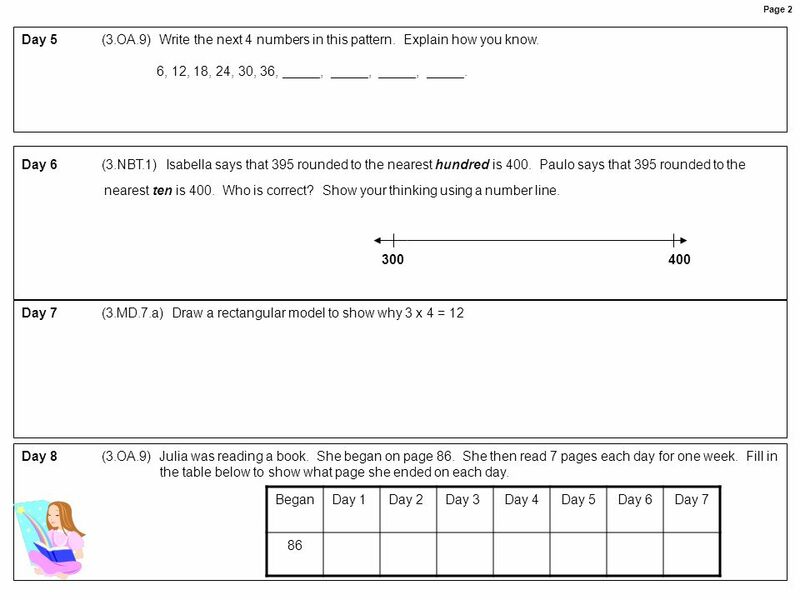 Use this open number line to show your work. Day 22	(3.NBT.3) Monica delivers newspapers to 60 customers every day. How many papers does she deliver in 7 days? Day 21 (3.OA.3) Tabitha bought 3 packages of pencils. She purchased 24 pencils in all. How many pencils were in each pack? Day 23 (3.OA.5) Dixon says that 6 X (3 + 5) is equal to (6 X 3) + (6 X 5). Is he correct? Draw a picture to prove it. 9 Day 24 (3.MD.8) What is the perimeter of the rectangle below if each square has side = 1? 10 Page 8 Day 27	(3.MD.7.c/3.OA.5) A rectangular blanket is 9 feet long and 6 feet wide. Find the area by using the Distributive Property (*Hint: Break the rectangle into smaller rectangles) Day 28	(3.OA.6) A group of 36 people want to rent cars. Each car holds 4 people. How many cars should the group rent? Write the division problem. 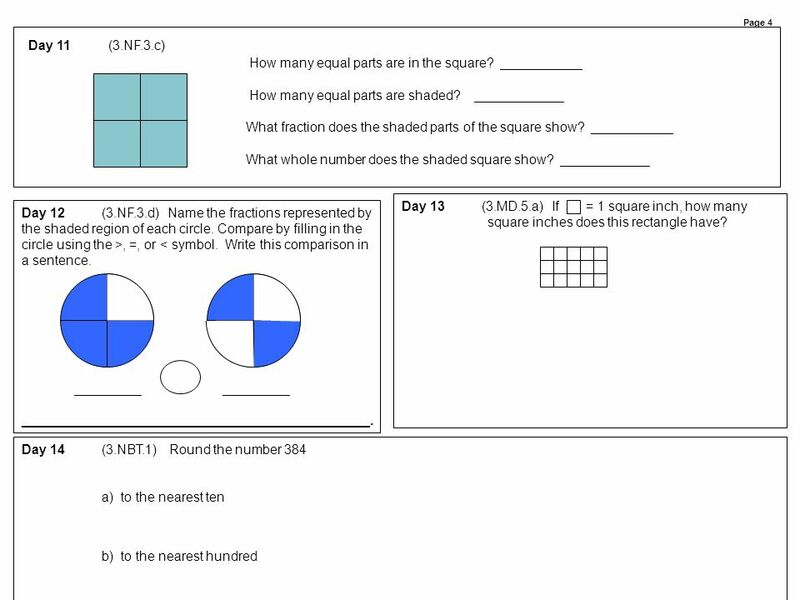 Rewrite as a multiplication problem with a symbol for the unknown factor. Solve it. 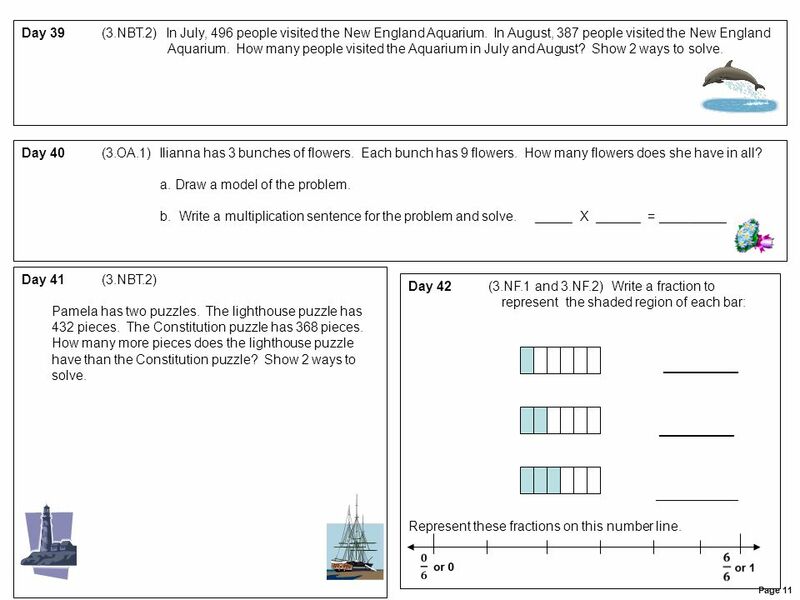 Day 30 (3.OA.8) What is the value of N if N + 3 = 46 What is the value of D if 4 X D = 28 Ashley had some stickers. She had 62 after Adam gave her 4 of his stickers. 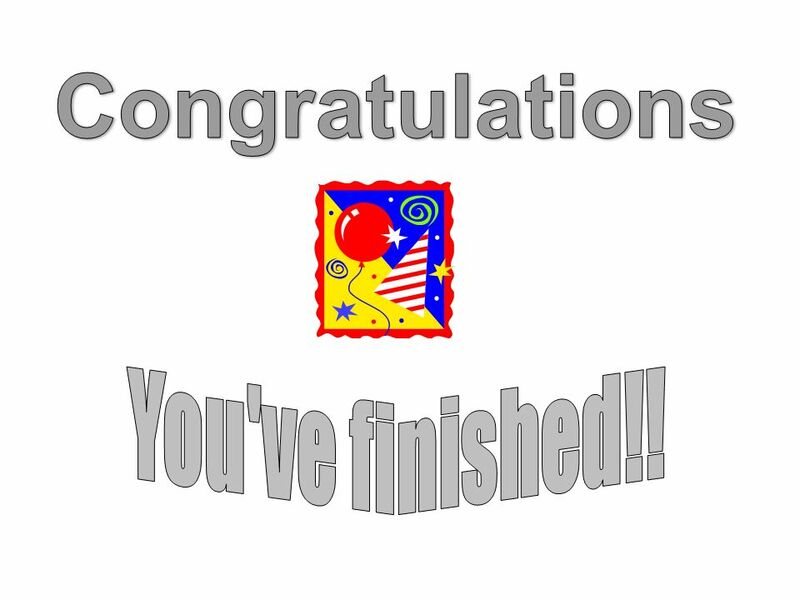 How many stickers did Ashley have at first? Write an equation using the letter F for the number of stickers Ashley had at first. Solve it. 14 pieces of fruit will you have left? Download ppt "“A Problem a Day, While You’re Away”"